What breed is that doggy in the window? Chengdu bans 22 breeds in the city’s big districts. 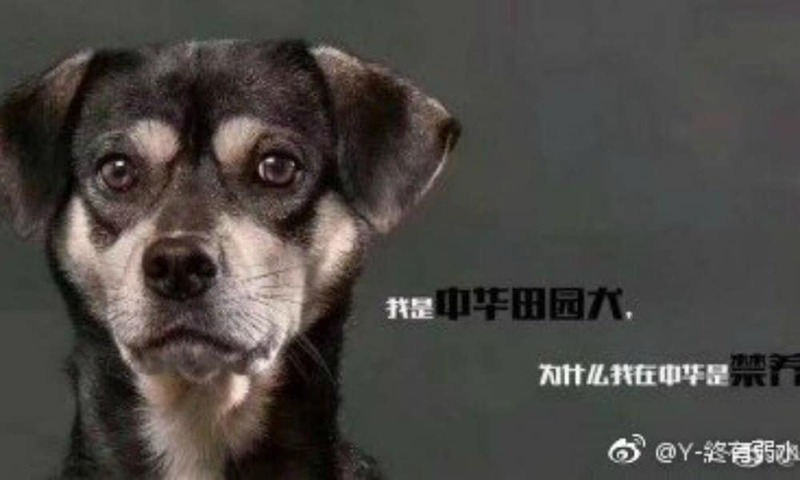 The ban on 22 dog breeds in the city of Chengdu, including the common Chinese rural dog, has sparked anger among many Chinese netizens on social media. Starting from November 16, the city of Chengdu will ban a total of 22 dog breeds in several restricted areas in the city, which includes major Chengdu districts such as Wuhou, Chenghua, Jinniu, and Jinjiang. The banned breeds are mostly larger dogs, or those known for their sometimes aggressive nature. The banned dogs breeds include the German Shepherd, Staffordshite Terrier, Mastiff, Bull Terrier and Pitbull Terrier, Akita, Newfoundland, Great Dance, and others (see full list here). The list also includes the common Chinese rural dog. The hashtag “Chengdu Cleans Up Dogs” (#成都清理禁养犬#) had over 330 million views on Weibo at time of writing, making it the top trending topic of the day. Pet owners are devastated about the ban on 22 dog breeds in Chengdu. Earlier this week, Chengdu Expat already wrote about the new measures, which reportedly are implemented to “create a civilized and hygienic environment,” and to push pet owners to register their dogs. GoChengdu also warned pet owners that if they live in a restricted area and their dog belongs to the banned breeds, they need to find a new home for it (in an unrestricted area) before November 16. Chengdu Expat also recommends pet owners to make sure their dogs have the right vaccinations, and to keep their pet passports with them at all times. 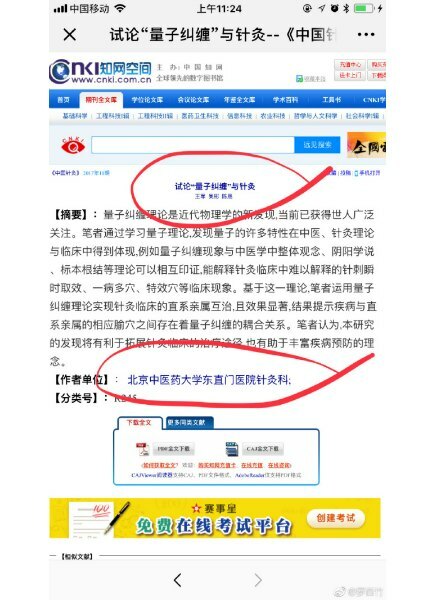 On Weibo, many netizens are dismayed with the recent measures. “They shouldn’t ban the dogs, they should educate pet owners,” many commenters say. There are also commenters, however, who say they support the new crackdown on bigger dog breeds, saying it protects people and makes the city a safer place. The past year has seen many incidents with dogs making headlines in China. 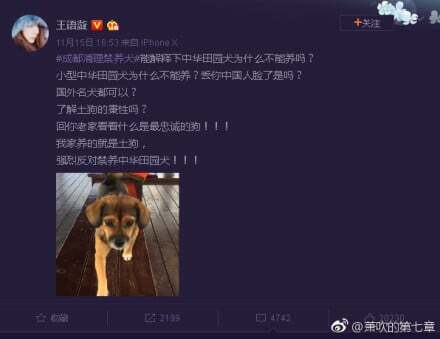 In late October, two incident of (unleashed) dogs attacking people in the streets, leading to serious injuries, went viral on Chinese social media – also leading to more people calling for better dog regulations in China. “How could such a study be published in a renowned scientific publication?,” some wonder. 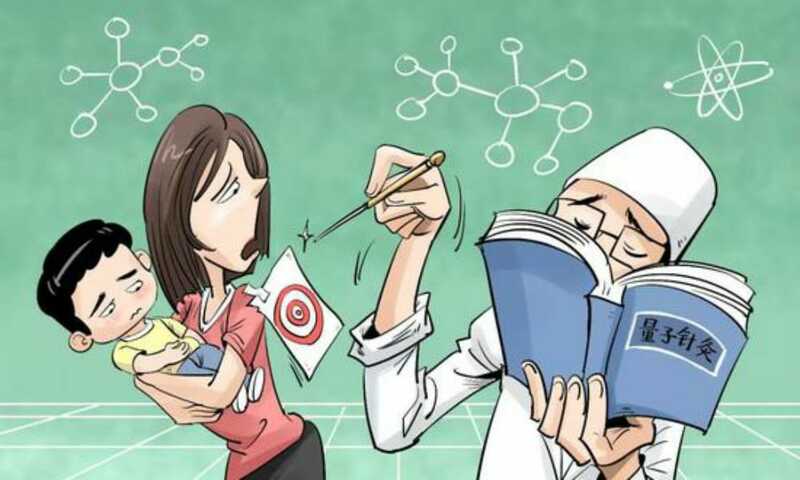 Cartoon published by Beijing News in response to the study, by illustrator Liu Jun 刘俊. A Chinese study published in a renowned academic periodical has received much online attention this week. The research, that suggests sick children could be cured by performing acupuncture on their parents, has generated waves of criticism – many of those commenting are doctors themselves. 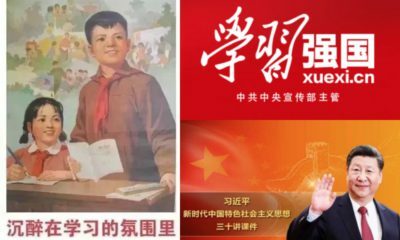 A Chinese academic publication has stirred controversy recently, nearly a year after it was published. 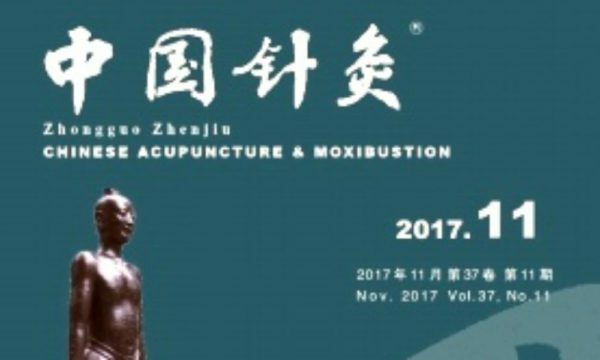 In November of 2017, the Chinese journal Chinese Acupuncture & Moxibustion (中国针灸) published an article titled “Discussion on Quantum Entanglement Theory and Acupuncture” (试论“量子纠缠”与针灸), written by Wang Jun (王军), Wu Bin (吴彬), and Chen Sheng (陈晟), who are affiliated with Beijing’s Dongzhimen Hospital and its Beijing University of Chinese Medicine. The authors of the study suggest that there is a so-called ‘quantum entanglement’ between parents and children. As explained by Science Daily, ‘quantum entanglement’ refers to the idea that “two particles, no matter how distant from each other in space and time, can be inextricably linked, in a way that defies the rules of classical physics.” (Read more on quantum entanglement here). A summary on the first page of the published paper. 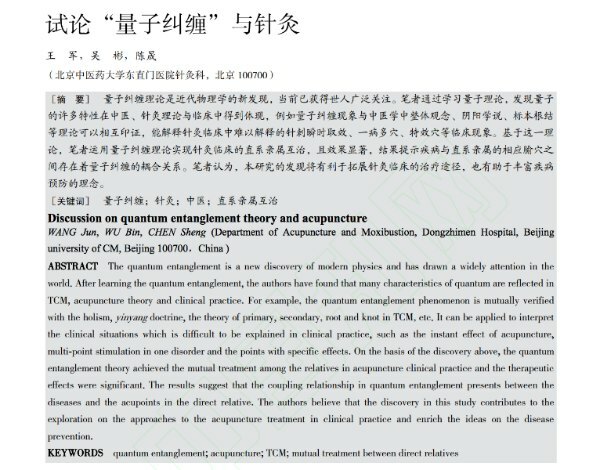 In the controversial paper, Wang and the two co-authors argue that the characteristics of quantum entanglement are reflected in Traditional Chinese medicine (TCM), acupuncture theory, and clinical practice, and that acupuncture on a parent would theoretically also be able to treat their children; in other words, suggesting that a sick child (or a child in pain) could benefit from a mother undergoing acupuncture. The same principle would apply to sibling relationships. Author Wang Jun and co-authors describe they have conducted experiments with 15 patients with pain symptoms and their direct relatives to prove their theory; 14 of these patients and their relatives were put in the same room when receiving the acupuncture treatment, while one patient was separated from their relatives when they received the treatment. Upon completion, the results indicated that all patients’ pain symptoms were at least somewhat alleviated. In four patients, the pain even disappeared. 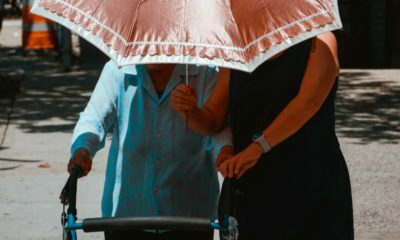 The study received online attention when it was discussed on popular Q&A platform Zhihu.com and on a science blog earlier last week (September 14). The full version of the publication can be found in the online China Academic Journals Full-text Database, better known as CNKI (中国知网), a national online database under the lead of Tsinghua University. The doctor further reprimands the magazine and the authors for letting such a controversial study enter the publication, and thus international academic databases. The study, further also criticized on a Science Net blog (where parts of the study were also republished), then started to gain attention on Weibo and other social media platforms, where many popular accounts started spreading the study’s findings. 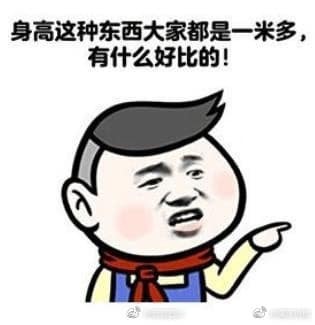 Hashtags such as “Treat the mum with acupuncture if the child gets sick” (#孩子生病扎他妈治疗#）received more than four million views at time of writing. The research also received attention in Chinese newspapers and online media, where reporters asked other scientists to comment on the controversy. 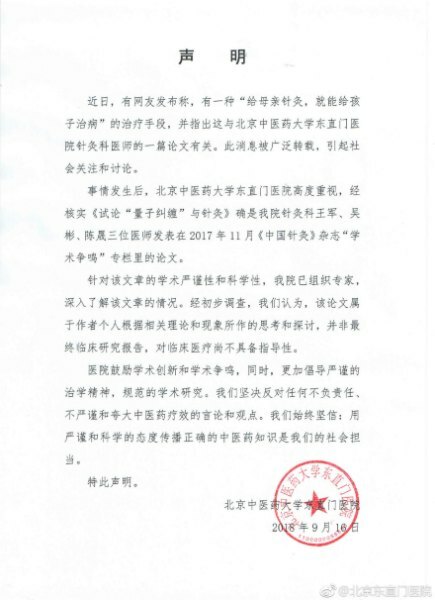 Since the research has gone viral on Chinese social media, Beijing Dongzhimen Hospital has responded to the controversy from its Weibo account (@北京东直门医院) with an official statement. The statement confirms that the authors of the publication are affiliated to the Dongzhimen Hospital of the Beijing University of Chinese Medicine, and says that the hospital has let other experts look into this research. Many people also take this research as an opportunity to criticize Traditional Chinese Medicine. “Traditional Chinese Medicine are a national treasure, but too many people use it to cheat on others,” one another commenter writes. “It is swindlers such as these who have destroyed TCM,” another person replies. According to Chinese online media outlet The Paper, the study’s authors have not responded to any requests to comment on the controversy over their theory. Featured cartoon published by Beijing News in response to the study, by illustrator Liu Jun 刘俊. Where Do the Tallest People in China Live? From north to south, it’s a world of difference. A physical anthropological study on height recently became a topic of discussion on Weibo: where in China are people tallest, and where are they the shortest? A recent study ranking the average height of people living in various Chinese cities has triggered some discussions on social media. The study, that was conducted by research teams from institutes in Tianjin, Inner Mongolia, and Jinzhou (China Institute of Physical Anthropology) establishes the average height of men and women between the ages of 22-40 from 31 different cities in 22 provinces around China. 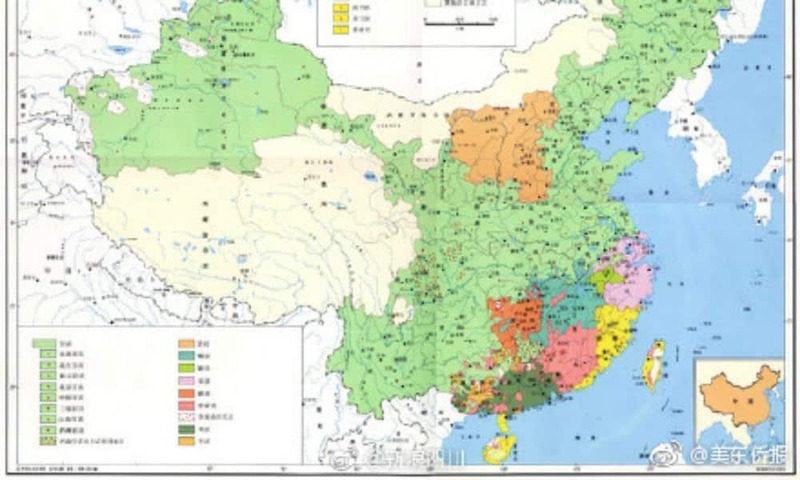 The outcome of the study indicates that China’s tallest people live in the more northern regions. Specifically, China’s northern provinces of Liaoning and Jilin are home to the tallest people in the country; on average 173.45 cm for men and 160.52 cm for women. Jiangxi, Sichuan, and Hunan inhabit the shortest people on average (165.59 for men and 155.06 cm for women). 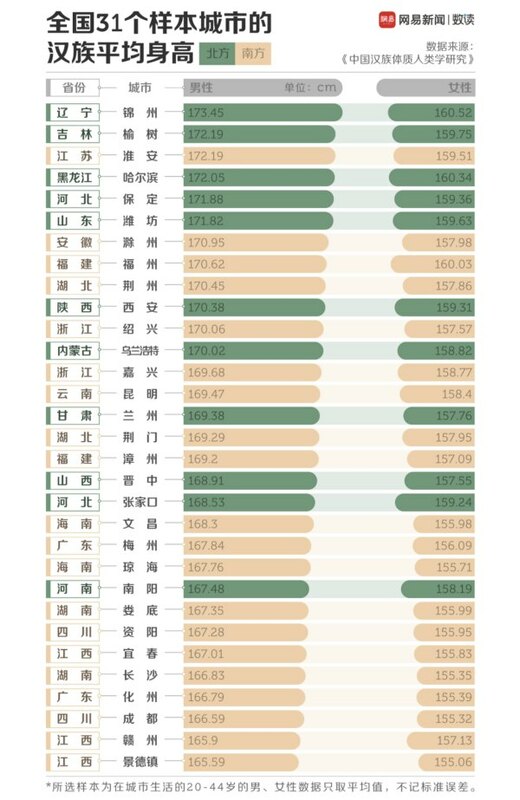 The table shows the tallest people in China based on the study. In the study, one possible reason for the height disparity from north to south is due to latitude. As the latitude increases, so does the average height throughout the provinces. Another reason is the quality of life and economic development in various areas. According to LiveScience, the tallest men in the world live in the Netherlands (183 cm on average), whereas the tallest women come from Latvia (170 cm). Even the people from China’s southern provinces are still much taller than the average height of those living in the country with the shortest people; the shortest men in East-Timor have an average height of 160 cm, and women in Guatemale have an average height of 149 cm. On Weibo, reactions to the study results are nevertheless mixed, with some netizens saying they don’t trust its outcomes. Many people share their home province and personal height in hopes to prove the results are flawed – some also include the height of family and friends. Meanwhile, some comment sections on the topic seem to have turned the discussion into a dating pool. “I’m 180 cm, and looking for a girlfriend,” one male commenter writes.